BrainFizz - Routing, Making, Custom projects & Training. : Experimenting with finishes - Varnish: Part II, playing around still. Armed with these new finds, I headed back to my workshop, (it's a conservatory), and made a start on "the cook". 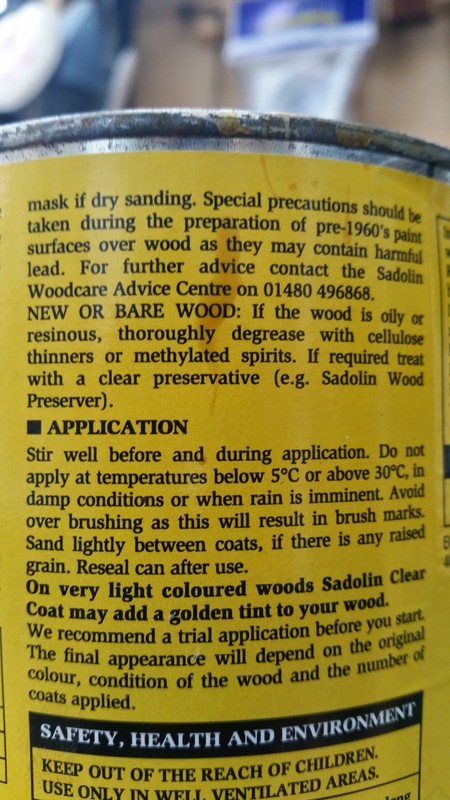 First I read the labels, the yacht varnish says to clean brushes with white spirit - hence the trip to find this can, but the Sadoin label is a little more vague, along with a list of various chemical ingredients it actually has no reference to how to clean your brushes out?! Any reference to a cleaning fluid is cellulose or methylated spirits. Both of which I fortunately have. Some cans are better equipped with instructions than others! 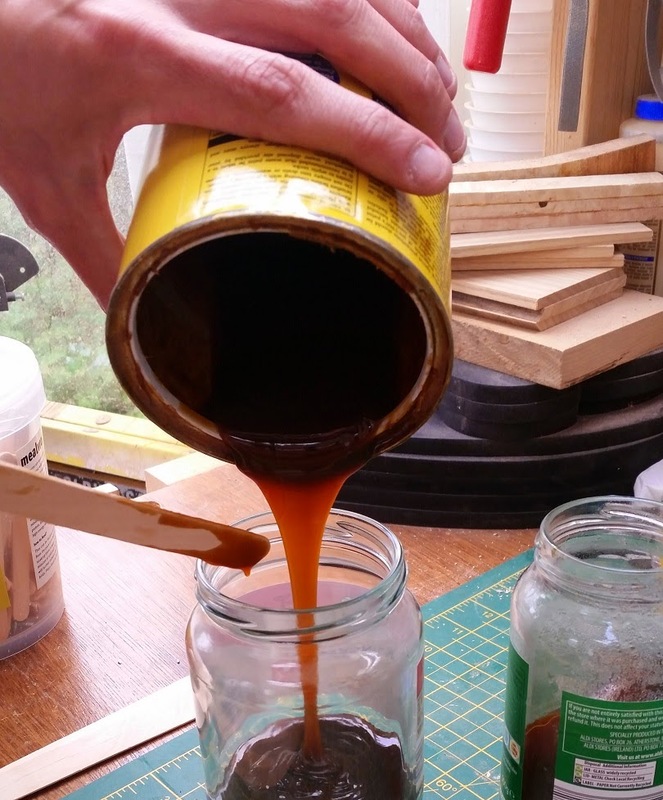 As you know, my plan is create my own oil/varnish blend for salable projects with a tactile finish. What you might not know is I'll be trialing the blend out on a garden bench. So if all goes wrong, it's not the end of the world. unless that world is a warm summer's evening with a cold beer in the garden. I pulled the thick skin off the top, and put it in a glass jar. Next I poured the rather gloopy mess from the can into a second, making sure to not spill it all over the place, and to try and get every last scrap out of the old can before binning it. Waste not, want not! There was actually more in the tin than I thought so there's plenty to play with here, and once thinned out and mixed with oil, it' should be enough to go a long way. Assuming all goes to plan! Making sure I get every last bit. I'm by no means a varnish or chemical expert, but I do know they can be put into two camps. Ones that can be reversed, such as shellac - which can be re-dissolved using it's base solvent (methylated spirits).And ones that can't. such as polyurethane and epoxy. These cure in the air. Since the can mentioned Meths, this may well be the former. 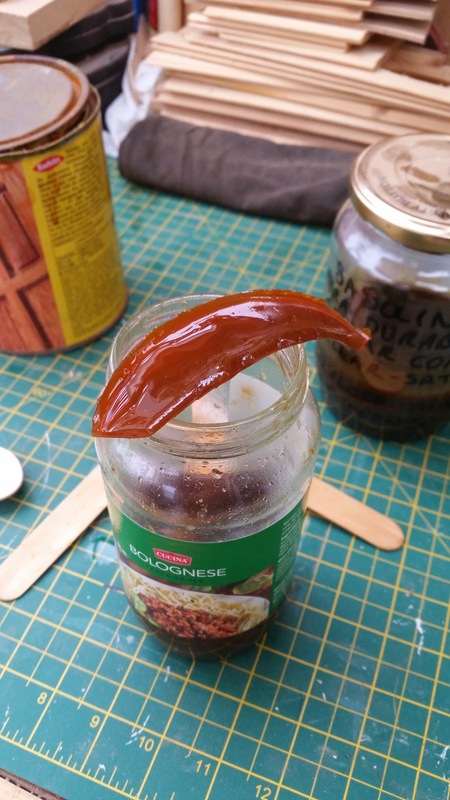 So just to check I poured some cellulose thinners in the can with the skin and set it to one side overnight to see what happened. After about 24 Hrs soaking in the thinners, the skin had definitely done something, by that I mean, not what I'd wanted! :-) All the bits were noticeably smaller, but had not completely dissolved. I'm uncertain as to weather it had just dissolved the un-cured bits away, or actually made a start on the solids. They were at at least a lot cleaner, and more transparent in colour. Not quite the result I'd hoped for, but a step in the right direction. I decided at this point to just fish out all the bits and bin them. Moving forward I simply poured in a similar amount of the remaining varnish, and added some raw linseed oil. This mix is Approx 1:1:1 Cellulose thinners:Varnish:raw linseed oil. 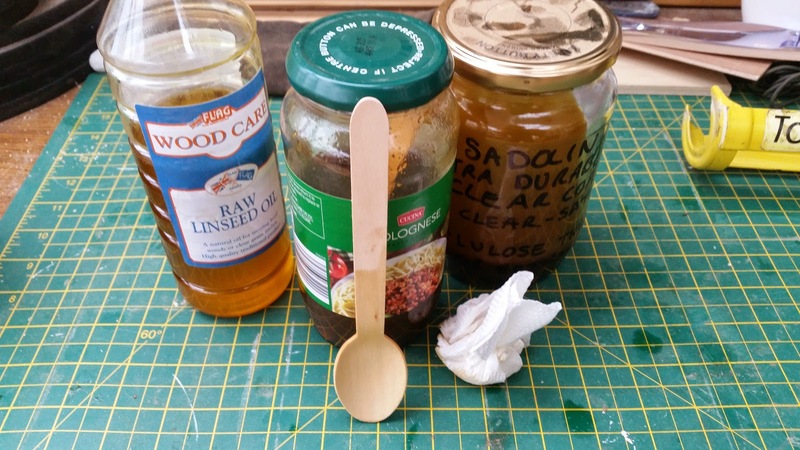 The choice of raw linseed oil over boiled was purely down to volume. Simply put I have only a small amount of BLO, compared to nearly a bottle of raw. So, a little more of the waiting game, to see what'll happen to the spoon. 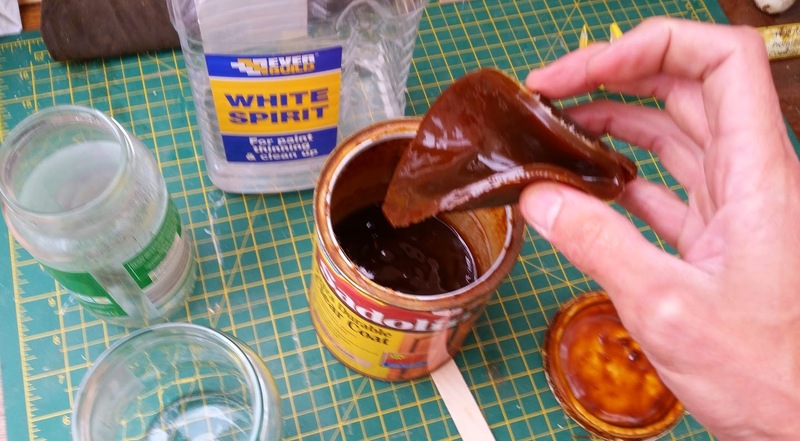 I still fully intend to play around with the yacht varnish and white spirits mixture, but I think I'll see how this goes first. The weather is pretty rubbish at the moment (typical of the Bank holiday!). Not only is this an exercise in experimentation, but also a potentially a money saving exercise since if successful it will save having to buy in new finishes by using up things that would otherwise have not been used for so long, they would no doubt have gone off and been land fill (Oooh! an environmental aspect too, NICE!). Hopefully you'll find this as interesting as I have! Let me know, do you like to experiment too?